In a new anti-Israel, anti-U.S. video, an American al Qaeda member makes reference to his Jewish ancestry for the first time in an official al Qaeda message. In the video, Adam Yahiye Gadahn, also known as Azzam the American, discusses his roots as he castigates U.S. policies and deplores Israel’s offensive in Gaza that started in late December 2008 and continued into January. 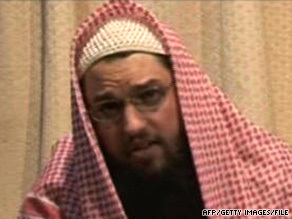 “Let me here tell you something about myself and my biography, in which there is a benefit and a lesson,” Gadahn says, as he elicits support from his fellow Muslims for “our weapons, funds and Jihad against the Jews and their allies everywhere.” “Your speaker has Jews in his ancestry, the last of whom was his grandfather,” he says. Growing up in rural California, Gadahn embraced Islam in the mid-1990s, moved to Pakistan and has appeared in al Qaeda videos before. He was indicted in the United States in 2006 on charges of treason and material support to al Qaeda, according to the FBI. Gadahn is on the FBI’s Most Wanted List, with a reward of up to $1 million leading to his capture. FBI records show Gadahn’s date of birth as September 1, 1978. The video — in which Gadahn speaks Arabic, with English subtitles — surfaced on Saturday. This account is based on an English transcript provided by As-Sahab Media, the media production company used by al Qaeda.